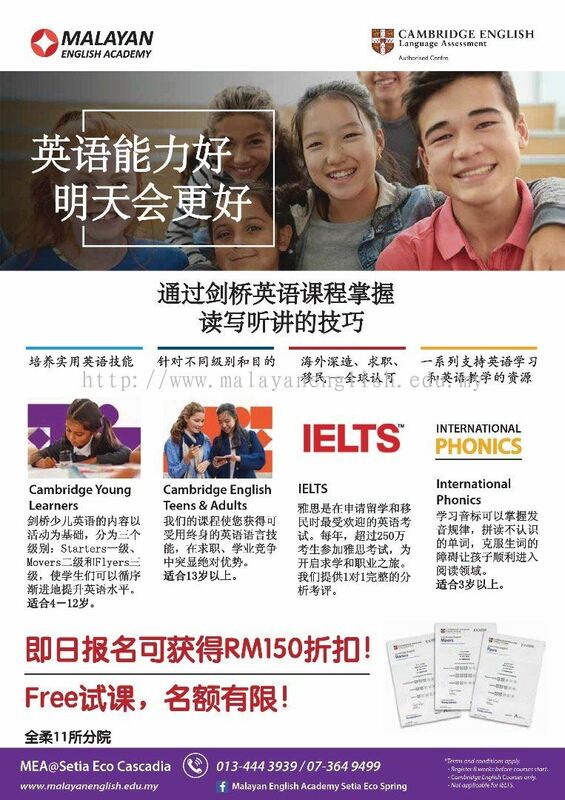 Malayan English Academy - Find the right course to suit you! Malayan offers General English, IELTS preparation courses, Cambridge English courses for young learners, teenagers, adults and also teachers. To add on to flexibility, we also provide private classes upon request. 67, Jalan Sutera Tanjung 8/2, Taman Sutera Utama, 81300 Skudai, Johor, Malaysia. 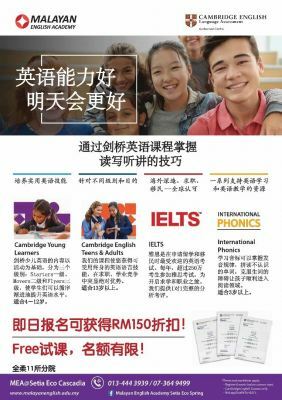 45A, Jalan Seri Impian 1, Taman Impian Emas, 81300 Skudai, Johor, Malaysia. No 71, Jalan Bina 1, Bina Park Seri Alam, 81750 Masai, Johor Bahru, Malaysia. 24A & 24B, Jalan Gaya 1, Taman Gaya, 81800 Johor Bahru, Malaysia. 51, Jalan Bukit Indah 8/13, Taman Bukit Indah, 81200 Johor Bahru, Malaysia. 3-G, Jalan Austin Height 8/3, Taman Mount Austin, 81100 Johor Bahru, Malaysia. 3, Jalan Kuning 2, Taman Pelangi, 80400 Johor Bahru, Malaysia. 87, Jalan Utama 34, Taman Mutiara Rini, 81300 Skudai, Johor, Malaysia. 19, Jalan Nusaria 11/5, Taman Nusantara, 81550 Gelang Patah, Johor, Malaysia. 49, Jalan Eco Cascadia 6/1, Taman Setia Eco Cascadia, 81100 Johor Bahru, Johor, Malaysia. 1-7B, Jalan Maju 1, Taman Maju, 83000 Batu Pahat, Johor, Malaysia. Malayan English Academy was incorporated in 2000 in Skudai, Johor. We’re proud to provide the world's leading range of qualifications for learners and teachers of English, and our mission is to be the experts in language assessment and in delivering excellence and innovation. 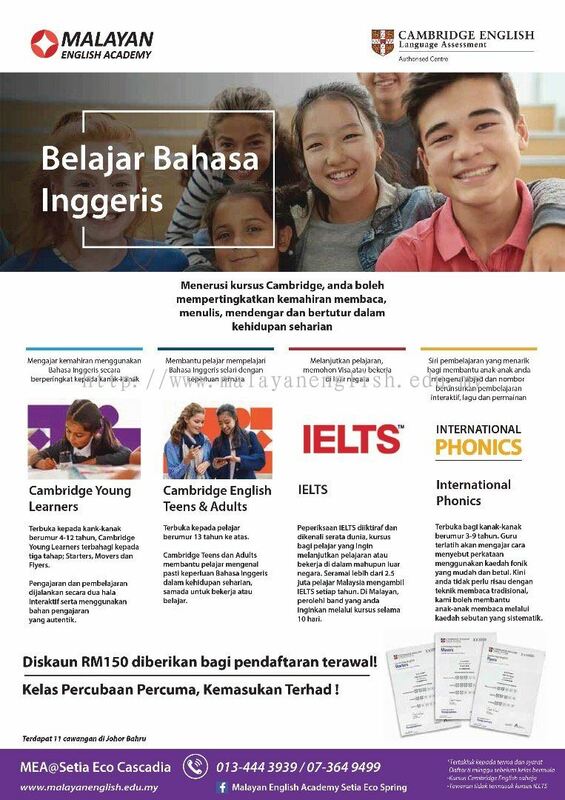 In 2011, the University of Cambridge appointed Malayan Education Sdn. Bhd. as an Authorized Exam Centre and TODAY, we operate as an MOE licensed language operator in Johor. Each year we deliver English courses and exams for more than 1500 people. 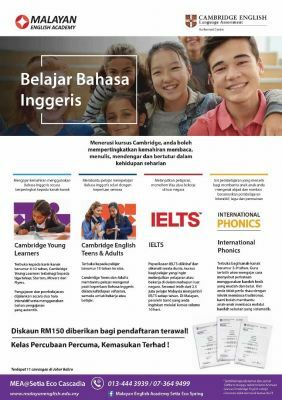 Our staff works from the HQ in Taman Sutera Utama, which is supported by a network which includes a certiﬁed Speaking Exam Team Leader, over 15 Speaking Examiners, over 30 qualified English teachers and international publishers. 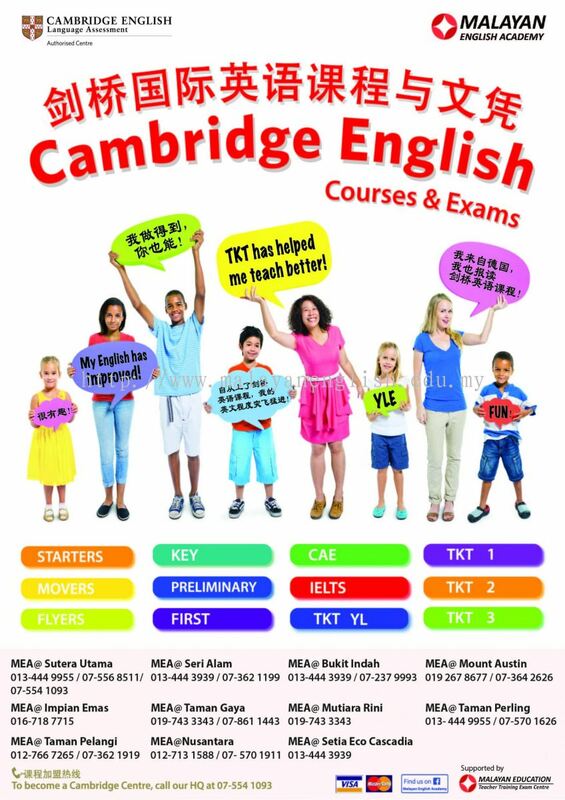 Malayan English Academy provides authentic Cambridge English courses and upon completion of a course, candidates sit for a Cambridge English exam. Upon completion, candidates graduate with an internationally recognised certiﬁcate from the University of Cambridge. As an Authorized Centre of University of Cambridge, we are supported by a large group of experts in language teaching. Provide full range of English language courses to learners ranging from as young as 3 years old to adults, corporate industries and teachers. Graduate with an internationally recognized certiﬁcate from the University of Cambridge. Provide career opportunities for outstanding candidates who satisfy our minimum professional requirements. For more information about our courses and franchise programme, you can click here to leave us a message now! 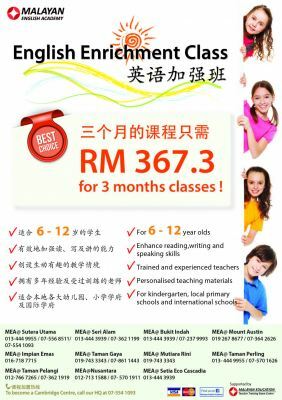 Malayan English Academy added new file in Course Price List. PROMOTION ! Our New Branch at Setia Eco Cascadia ! Malayan English Academy added new file in Informal Letter Writing. 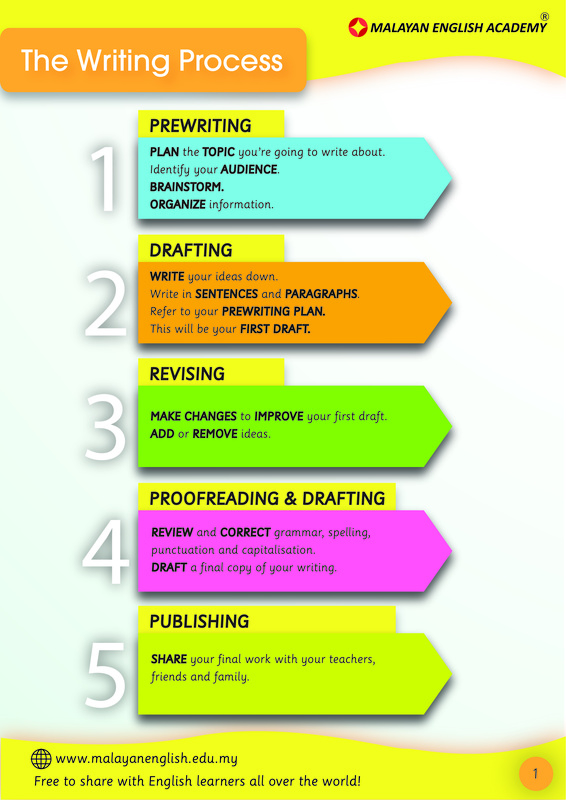 Malayan English Academy added new file in The Writing Process.